Baby Steps: Learning To Walk, The Hominid Way Bipedalism -- the ability to walk on two legs -- was a boon to early human evolution. But the shift from swinging tree-dwellers to two-footed walkers happened over the course of millions of years. Millions of years ago, our ancestors, who were adapted to living in trees, started to experiment with walking upright. These chance experiments turned out to be a useful skill, and over time we humans evolved bodies built for upright walking. 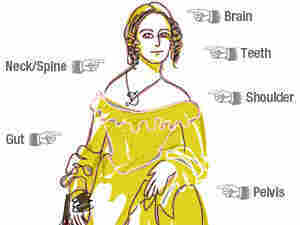 From our neck to our feet, this brought many changes to our skeletal structure. We also evolved hands better adapted for fine motor skills, and big brains that ultimately helped us develop language. The lovely Emma Darwin, wife of Charles, has graciously volunteered to demonstrate the differences between humans and chimps. Just click on her body parts for more. Ask four anthropologists what the most important development in human evolution was, and you'll get five answers. Was it standing on two legs? Hands that can make tools? The big brain? Usually, it's whatever the scientist is studying at the moment. But two-leggedness -- bipedalism -- may well be the place to start the story of human evolution. It's rare among living things. Four legs is easier. It's stable, and can cover ground a lot faster. And that has been the animal architecture of choice for eons, at least for most mammals. Our earliest primate ancestors were no exception, whether moving in trees or knuckle-walking on the ground. But somewhere along the line, primates discovered how to stand up and walk on two legs. It stuck, because natural selection favors new traits that give their owners a survival advantage. Even though, as anthropologist Ian Tattersall points out, it all starts by chance. "Natural selection can't call things into existence just because they are desirable," says Tattersall, one of the deans of human evolutionary research. "Novelties happen randomly." I don't think you come down to the ground and decide it would be a really good idea to stand upright and move around. And, says Tattersall, who works at the American Museum of Natural History in New York, it takes a long, long time for novelties -- like standing up to walk -- to take hold and change a population of animals. "The earliest hominids didn't become upright walkers the way we did right away," he explains. The hominids -- our ancestors and their close relations -- were adapted to living in trees. But there may already have been something going on in their bodies that predisposed them to walk on two legs -- like standing up and "walking" in the trees. It's a bit like orangutans do, reaching their arms up to branches to brace themselves as they move along. Tattersall says it makes sense that arboreal primates may have been "primed," for upright walking on the ground. "I don't think you come down to the ground and decide it would be a really good idea to stand upright and move around," he says. "I think the only reason you would do it is because this is what came naturally to you in the first place." This "tree-walking" may have been something even monkeys did. 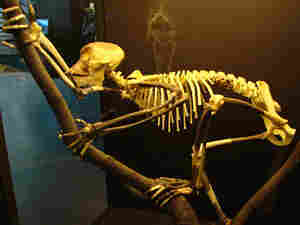 Primitive monkeys started to split off from the lineage that led to apes and humans more than 30 million years ago. Some of them also evolved to walk upright. Their walking style is a lot more primitive than ours, but it could hold clues to how our own ancestors learned to walk. Much of the body we have today took shape millions of years before the first primate emerged. Susan Larson from the anatomy department coaxes Parker down an enclosed trackway where scientists videotape his "monkey-walking." "He's very good at it," she says as she offers him a jelly bean. "They do it in the wild." Larson is trying to understand how the muscles and bones in the monkey allow Parker to walk -- badly, a sort of high-stepping goosestep, but walk nonetheless. "If we have structures that appear the same, look the same in humans in monkeys, then the reason why they look the same is because they work the same," she explains. These include structures like a wide blade at the top of the hip bone that allows for more muscle attachments to help in balancing. Features like these seem to be part of a kind of "walking" tool kit. If some of the same tools show up in fossil bones of our own ancestors, it could explain the early evolutionary changes that allowed us to walk. There's a general consensus among scientists on when our ancestors first walked on the ground: about 6 or 7 million years ago. But why is harder to agree on. Anthropologist William Jungers at Stony Brook favors the "Look, Ma: Hands" hypothesis. "When animals walk bipedally -- other primates -- it is often in the context of carrying, whether they are carrying food items, stones," Jungers says. "I think carrying is the most plausible precursor for bipedality." Free hands may be the devil's playground, but they gave our ancestors the means to gather and carry food and eventually make tools. Free hands improved the chances of a long life and many offspring. There are other ideas, though. One holds that the African climate dried out and forests turned into savanna. Without dense forests, our ancestors were forced to walk instead of swing on a branch to find the next tree. 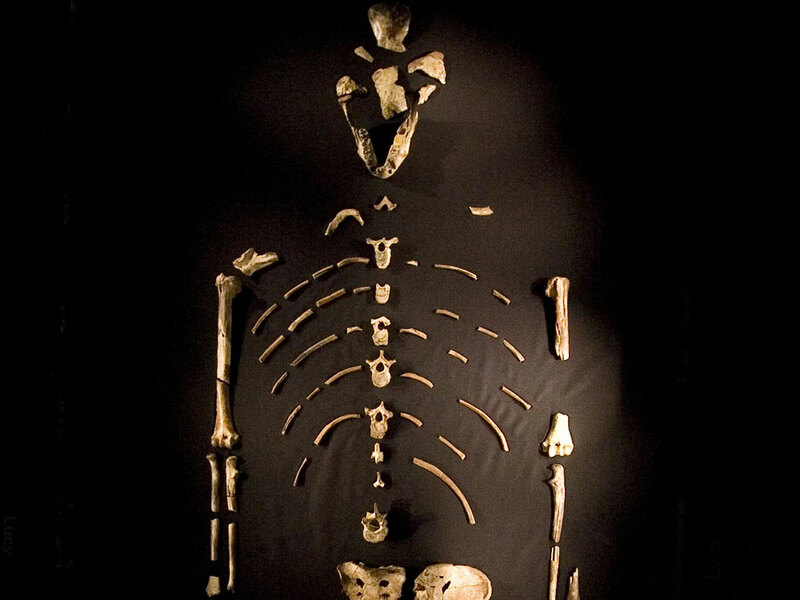 The 3.2 million-year-old fossilized remains of "Lucy," on display in Houston in 2007. 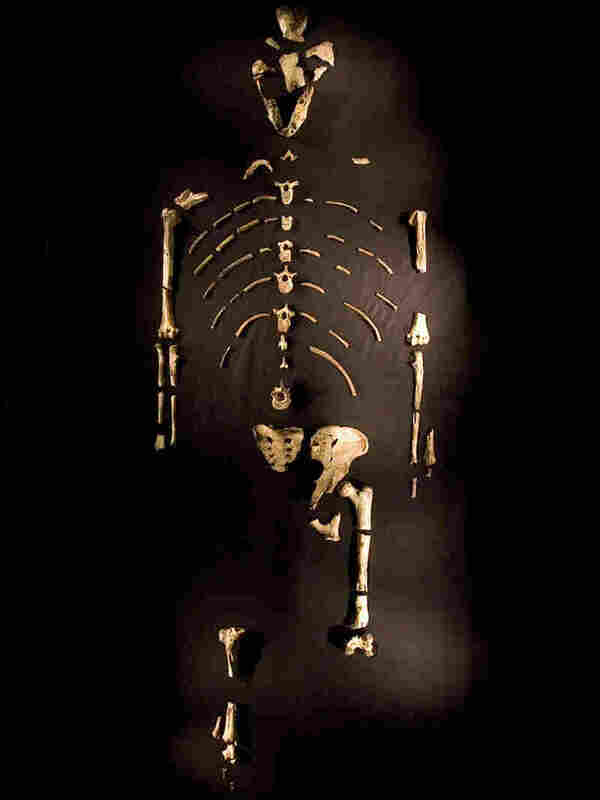 Lucy has skeletal characteristics like long legs and an in-line big toe that indicate she was good at walking. Her hands and arms, however, were built for climbing, indicating she split her time between the trees and the ground. Whatever the reason, though, walking was still just a part-time thing for millions of years. Trees were still our home base. "When you're going to travel, you come to the ground and you move. Whether it's through the forest or across the savanna, it doesn't matter -- you're a biped when you're moving," Jungers says. "But where do you sleep? You sleep in the trees. Where do you go to escape predators? You move to the trees." You can see evidence of this split-level lifestyle in the bones of one of our early relatives: Lucy, the pint-sized Australopithecus who lived about 3 million years ago. She had longish legs and a big toe in line with the other toes, both good for walking. But her hands and arms were still built for climbing. Her strategy was to be mistress of both worlds. But mistresses eventually have to make a choice. The real question, Jungers says, is why we abandoned that strategy or chose an alternative strategy -- the alternative being full-time living on terra firma. Again, there's no consensus on why. Maybe the African forests thinned out. Or walking led to running and hunting down bigger meals. One thing is for sure, though: The more we walked, the more our bodies changed. Jungers pulls his office chair over to an assembled human skeleton hanging like a suit from a hanger. "We've elongated this lower part of our body," he says, gesturing to the long bones of the legs. What that gives us, he says, is efficiency. "Locomotion really is priced by the step, so increased stride length has tremendous economical advantages." The longer leg meant we could go farther with a given amount of effort. Other changes followed: a springy arch in our foot, for example, made us more efficient walkers. We developed a spine that centers our weight over our legs to keep our balance. As a result, we did better than other primates. First-rate walkers could travel to find food, water or the best stone for tools. Wanderlust was born -- along with romantic walks on the beach. Bipedality made a big difference in a hostile and unforgiving world. Eventually a new genus was born: Homo. Humans. Not the "noble" savage -- the "mobile" savage. And we've kept both feet on the ground ever since.